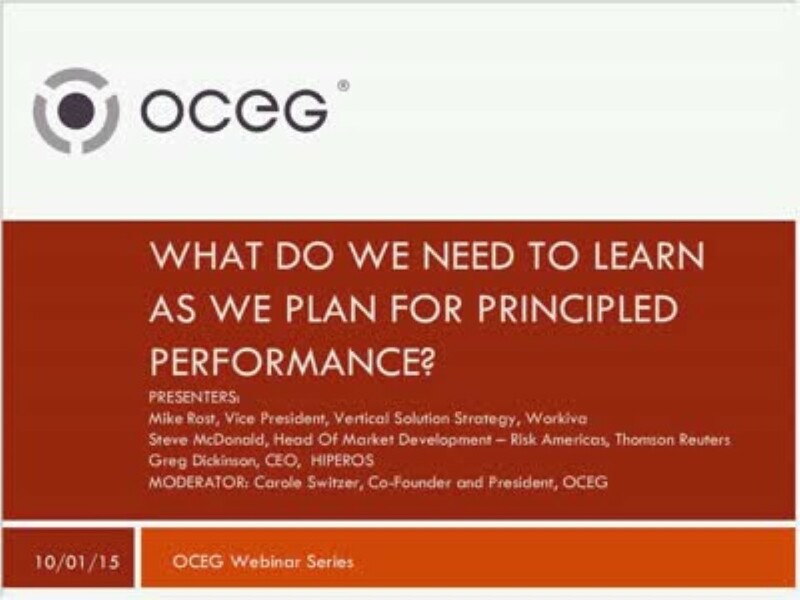 This webcast reviews the Learn component of the OCEG GRC Capability Model v3 (Red Book). Principled Performance is all about being able to reliably achieve objectives while addressing uncertainty and acting with integrity. That dictates setting objectives and strategies, based on a full understanding of the external and internal contexts within which our organization operates and responding to them appropriately. How do we know we have set objectives that can be achieved? What do we need to keep an eye on to make sure nothing changes that might affect our outcomes? What might happen outside of the organization, in the external business context in which we operate, that causes threats or new opportunities to arise? How might we be affected by regulatory requirements, third party operations, geopolitical or social upheaval and other factors? What internal changes to business plans, operations or culture might give rise to a need for new strategies or tactics? How can we possibly keep track of all of this and make sure that we stay informed, agile and resilient in the face of ever faster and greater change? These are just some of the questions that we will address in this webcast, which focuses on the Learn component of the new OCEG GRC Red Book. Join OCEG and sponsors of the first installment in the OCEG GRC Capabilities Illustrated infographic series as we take a look at the importance of examining and understanding the context in which we operate, designing durable objectives and implementing appropriate risk and compliance management to ensure we meet those objectives. We have emailed instructions to access What do We Need to Learn as We Plan for Principled Performance Part One of the GRC Capabilities Illustrated Ser to . Make sure the email arrives in your inbox: either add "support@oceg.org" as a safe sender to your email platform, or if you use Gmail, drag our email into your Primary tab.